Dear Rubi hosts tackles some of the most popular personal finance question on Reddit. Credit card debt, money issues with family and many more. We often hear that ‘cash is king’. But not when you’re carrying multiple currencies around in your wallet because you’re scared someone will steal it. Hosts Rubina Ahmed-Haq and Beau Humphreys talk to one concerned daughter who wants her mother do the right thing and put her huge stash of cash into the bank. Hosts Rubina Ahmed-Haq and Beau Humphreys present Dear Rubi to the world. 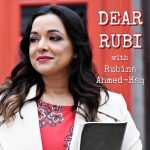 On this first episode of Dear Rubi they tackle an issue many young people deal with today: How to pay for university and manage student debt.